Pedal Fall 2015 features Canadian rider Catherine Pendrel on the cover as she won the UCI Mountain Bike World Championships for the second time along with Commonwealth Games Gold while her teammate Emily Batty claimed the silver. Our feature on perfect cycling in Norway covers the escapades of Canadian adventurers Janick Lemieux and Pierre Bouchard who have climbed back in the saddle for their latest undertaking called NOMADS© - cycling odyssey : nomads by nomads from cape to cape... starting in Norway. 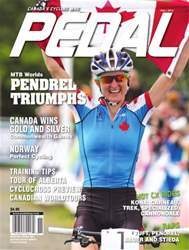 Check out our Cyclo-cross Season Preview plus hot CX bikes, Training Tips, Tour of Alberta report, Canadian WorldTours coverage and much more.